Benefits of a Good Dog! Welcome potential volunteers! 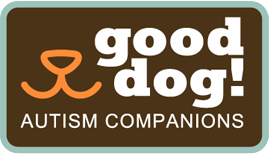 Thank you for considering donating your time and talents to Good Dog! Autism Companions! There are several ways to get involved and help our organization and families! You can make a difference and create miracles!! Please feel free to email us with any questions. Click on a photo/link below. "There's no such thing as a small act of kindness. Every act creates a ripple with no logical end." Gifts received with the greatest of gratitude. Copyright © 2017 Good Dog! Autism Companions. All rights reserved.